Life on the rocks of Georgian Bay is rough. But rewarding. Coming home from our last trip, David Clow and I were battered, bruised, bitten and burned. This pic reassured me it was all worth the trouble. Ingredients: Simplicity, the Unusual, the Mysterious, a nice composition with an accent in the right upper strong point, pleasing colour combination. For this image I had my Sony ILCE-7R sitting on the rocks on the edge of a small puddle. We had lots of rain, so plenty of puddles to choose from. 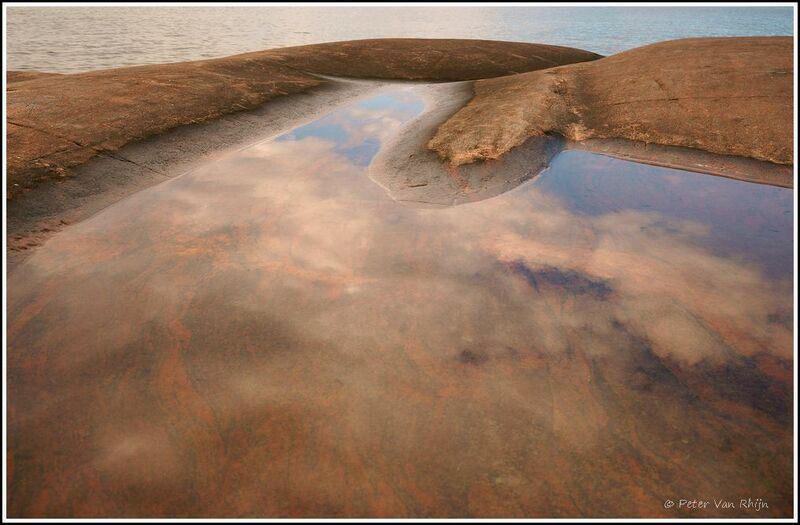 The clouds reflected and mixed with the reddish rock in the puddle. This image required low-angle viewing capability conveniently offered by the fold-out LED screen of this camera. I focused manually on the far ridge of rock. Autofocus might have become confused by the softness of the reflection in the foreground. Sony ILCE 7R, Zeiss 24-70 mm zoom at f 22 ; 1/125thsec., ISO 400. No tripod.